By Bob Sperber is a contributing editor to Control. How much time do your technicians waste testing instruments in-situ that don’t need recalibration? On one hand, it’s a sign of a healthy asset when a test reveals identical as-left and as-found conditions. On the other, it’s a waste to send technicians to the field too frequently. 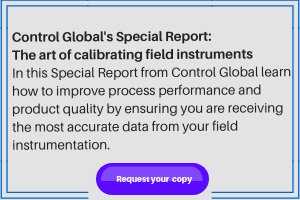 A 2007 survey by calibrator-and-software seller Beamex found that 50% of respondents across the process industries calibrate their instruments no more than once a year. In the pharmaceutical industry, 42% said they calibrate once a year, and another 42% calibrated twice a year. Some plants do pH calibrations 365 days a year to comply with wastewater rules. Reducing the frequency is an oft-cited benefit that comes from trending years of calibration test results. One engineer at a U.K. pharmaceutical plant, who oversees more than 8,000 instrument calibrations, told Control that he reduced his calibration labor 20% overall and 80% in a grinding and milling area, doubling intervals from three to six months; six to 12 months; and 12 months to two or more years. It’s hard to achieve these gains without a good CMS. Temperature control is critical for Ed Jett, plant engineer at Berry Plastics, Homer, La., which has up to 30 control zones per extruder. Calibration is a “big deal” for ISO 9001 and overall quality requirements, he says. Vendors estimate that 20-25% of process plants mate their smart calibrators to accompanying software. The rest use various databases, spreadsheet variants and file cabinets to track calibrations. Should you be part of that 25%? A plant with a few hundred instruments to maintain may not need a calibration management solution, while one with 1,000+ instruments won’t be able to maintain all the information or work flows without one. That threshold can move, depending on each plant’s assessment of current pain and potential benefits. HART protocol-compliant documenting calibrators tethered to CMS software reduced the amount of equipment and paperwork that has to be taken out in the field, according to Jeff Cason senior instruments and controls technician at Georgia Power’s Plant Yates, Newnan, Ga. His favorite features include “easy upload of calibrations to a PC and easy-to-read calibration certificates,” as well as “the ability to search for instruments that are due for calibration.” Plant Yates uses Beamex MC5 multifunction calibrators, vacuum calibration pumps, both high- and low-pressure calibration pumps and Beamex’s calibration software. In any given plant, smart calibrator know-how “depends on the size of the user’s instrument department,” says integrator Kristin Scharf, a consultant with New England Controls (NEC), who works with users of Emerson Process Management’s PlantWeb distributed control system (DCS). “Of the plants we work with, I’d say probably 30% have their own people who know how to use smart calibrators,” Scharf says. The other 70% have contractors such as NEC do their calibration and reporting chores. “While there’s a big switch to HART and Foundation fieldbus devices underway, acceptance has not reached the tipping point yet,” says Ed Shuler, senior applications engineer with Honeywell Process Solutions. So it stands to reason that users in primarily analog plants represent the largest share of CMS usage. The availability of calibrators can be a limiting factor because “many do not conform to the open FCINTF [field interface] standard and, therefore, can only be used with a proprietary CMS,” adds Olson. Likewise, few calibrators on the market to date offer Foundation fieldbus compatibility to fully automate the data from smart instruments. HART-compliant devices are more abundant, albeit with varying degrees of support. The U.K. pharmaceutical engineer mentioned above uses an “RX” edition of Honeywell’s DocuMint software, but test results are entered manually. Protocols and documentation are downloaded from the software to the calibrator, but the results are manually keyed into a standard PDA that, unlike calibrators, allows secure user ID sign-in. When data is uploaded to the PC software, its contents, including that user ID, is saved to a primary, uneditable report. If a company’s requirements include CMS data integration with plant asset maintenance (PAM) or enterprise systems, then this knowledge could help whittle down some of its software choices. Scharf and her associates at New England Controls gravitate toward Beamex calibrators and software for their interface and calibration database functions. In contrast, she recommends Emerson’s AMS plant maintenance system’s Device Manager with a Calibration Assistant “Snap-On” for plants in that vendor’s DCS environment who want an asset management tool. The latter is an integrated environment that combines calibration management with overall instrument maintenance and process control. DCS vendors offer CMS/PAM solutions developed in-house or through partnerships to simplify the user experience and consolidate calibration alerts, such as calibration due, with all other asset monitor alerts, such as pressure over-range for each device,” explains Olson. In addition, he adds that all such systems, including his company’s Mobility Device Management System, tie to the higher-level Asset Master. Most DCS/PAM system vendors only support a single, preferred calibration software package. Instrumentation and calibrator companies are similarly seeing an opportunity for integration, including Endress+Hauser, whose CompuCal connects with the higher-level FieldCare package—and an online portal for storing backup calibration tests and documentation, “so those calibration certificates will never be missing when an inspector comes by,” says Ben Keizers, E+H’s product marketing manager for services. And for a ubiquitous, intranet connection, CalWorks, from Norvada, goes a step further with a full, web-based CMS. Larger CMS/PAM packages also have added interfaces to IBM’s Maximo asset maintenance system and SAP’s plant maintenance and workflow functions. In process control, digital instrument information, including calibration trends, have been touted as helping plants move from scheduled, preventive maintenance to predictive maintenance. But few realize how calibration deviation trends can be used for predictive maintenance. In a predictive, condition-based maintenance program, a work order is scheduled, based not on calendar dates or hours of operation, but on when the instrument engineer can demonstrate that the calibration will drift. The benefits here include reduced disturbance to sensitive instruments fewer scheduled field trips. Consider the trend that results from repeated tracking of transmitter output values from a five-point calibration. CMS screens calculate and display the deviations over time, allowing the user to extrapolate when the instrument will drift next. “So in theory, you can go out two weeks before the instrument is going to drift out of spec and recalibrate to bring it back down close to 0% error,” says Honeywell’s Shuler (See “How to Predict the Next Deviation”). Engineers proficient with condition monitoring from vibration to lubrication oil analysis know that scheduled work orders aren’t eliminated, but in an asset-intensive environment, over time benefits can be gained in compliance, performance and cost reduction. Whether a plant is operating in full, analog or digital mode, sets its goals on stand-alone or integrated data flows, or cares to embark on predictive calibration maintenance, the first step is to take a look at the benefits CMS can bring.